The city lies on the Costa Blanca and is the second largest city of the autonomous region of Valencia, with 322 673 inhabitants. In 1858 the railway line was opened between Alicante and Madrid. Therefore, the port of Alicante grew to export harbor in the middle of Spain produced goods. Alicante has an airport (12 km outside the city). Actually, this airport is located in El Altet, a village just south of Alicante. The city of Alicante is one of the most amazing places on the Costa Blanca. Although it is a big city (similar to Utrecht), you have many places to feel like you've arrived in a much smaller place. Only when you are at the highest point of Alicante, on the 166 meter high Monte Benacantil state, you see how big the city is. In the downtown you notice it especially in traffic. However, if you walk into a lot quieter streets than the city life suddenly looks very different. Those looking for a combination of beach, sea and liveliness should consider Alicante definitely agree. In contrast to Benidorm this is still an authentic city where daily life has not been driven by tourism. Alicante has several beaches, including Playa del Postiguet is by far the most popular. The Alicante marina is worth to walk along with entertainment on the south side and Panoramis mall. Strolling done at the Esplanada de Espana. This promenade is generally seen as the heart of Alicante. You can also look around at the many stalls or on one of the terraces enjoy walking past the crowd. Come again arguably has one of the best climates in the Alicante of all cities in Europe. Rain comes in the summer just before and even during the winter months it is often pleasant enough during the day on a terrace to enjoy wine and tapas. Alicante by Dutch tourists still too often seen as a gateway to the seaside resorts on the Costa Blanca, and it just might be such a fun destination. The Doctor Balmis Square in Alicante is a small city square that makes the surrounding buildings or the size little impression. What is special is the way the square itself is arranged. The square is a tribute to the Spanish doctor Francisco Javier de Balmis who has been vaccinated many people in Latin America against smallpox. The square is decorated as a kind of miniature park, which is around the central fountain created a chain of banks. 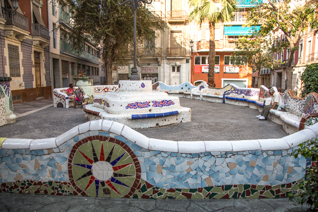 The decoration of the fountain and benches with mosaic giving the Plaza Doctor Balmis a special appearance. High above the surprisingly lovely city of Alicante stands the Castle of Santa Bárbara at the top of Mount Benacantil. Due to the high altitude of about 166 meters, this fort was once ideal for discovering unexpected visitors in time and take action. Although there have been findings that suggest that the principles of Castillo de Santa Bárbara are from the ninth century, however, the majority comes from the sixteenth century. The castle is only opened in the year 1963 to the public, where there are placed also two elevators. The entrance to these lifts is located in the mountain that you reach through the pedestrian tunnel on Calle Jovellanos. The castle is of course just to reach on foot. From the castle you have a breathtaking view of the Mediterranean Sea, Alicante and the mountainous hinterland of it. There are some areas beautifully decorated as museums and show objects and illustrations seen from the time when the castle was in use. Strolling do in Alicante on the Esplanada de Espana. The beautiful paved promenade attracts both day and evening many visitors who can walk there from the Port to Canalejas Park. Because of its location by the sea, there is a regulated on- what to detect cooling breeze which is very welcome in a place like Alicante especially in summer. Here and there you see locals play chess, discussions are being held on one of the many benches and chairs, you can cool off on a terrace and there can be found a number of stalls selling trinkets. When night falls, the romance up and it also serves as a popular meeting place. Esplanada de Espana, even the symbol of the city of Alicante. In the port of Alicante is a very special ship. It is a replica of the Santisima Trinidad, an eighteenth-century three-masted cal which was the flagship of the Spanish Armada, and one of the ships perished in the famous naval battle of Trafalgar. The smell of wood and the sound of the ship giving you the feeling that you are standing in a fairy tale, in which you feel like a real pirate. The deck, mast and rudder of course you can just touch. The seagulls and the sound of the sea take you in mind to faraway places. The ship was built and launched in 1769 year in Havana. He was the largest ship at that time and served 35 years in the Navy of Spain. The ship's hull, including the deck was made from Cuban mahogany, and the side walls are 60 cm thick. The ship proved to be unsinkable, because in the battle at Gibraltar which lasted two days, went to the "Santisima Trinidad" to the bottom. 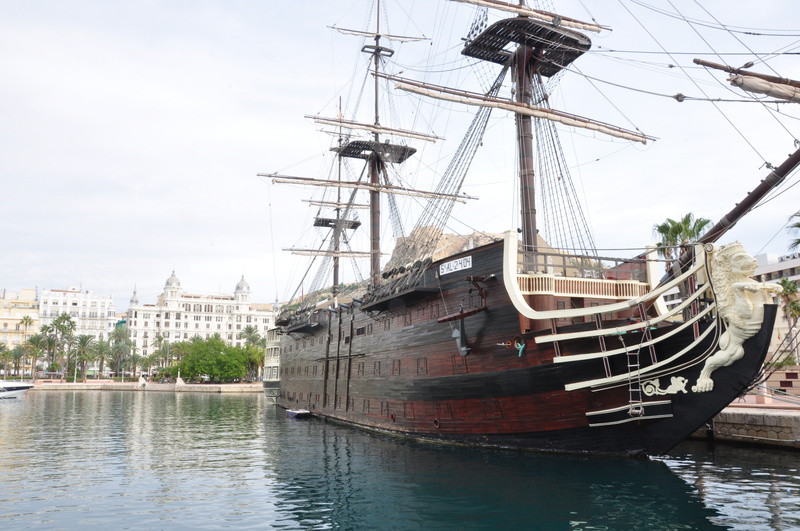 The ship "Santisima Trinidad" in the port of Alicante is open to the public: Hours 11: 00-24: 00 daily. This historic ship features a restaurant and a museum of pirates and sailors. The price of a ticket with a drink on weekdays € 4 and € 5 on weekends.